DeepSound is a steganography tool and audio converter that hides secret data into audio files. The application also enables you to extract secret files directly from audio files or audio CD tracks. DeepSound might be used as copyright marking software for wave, flac, wma, ape, and audio CD. 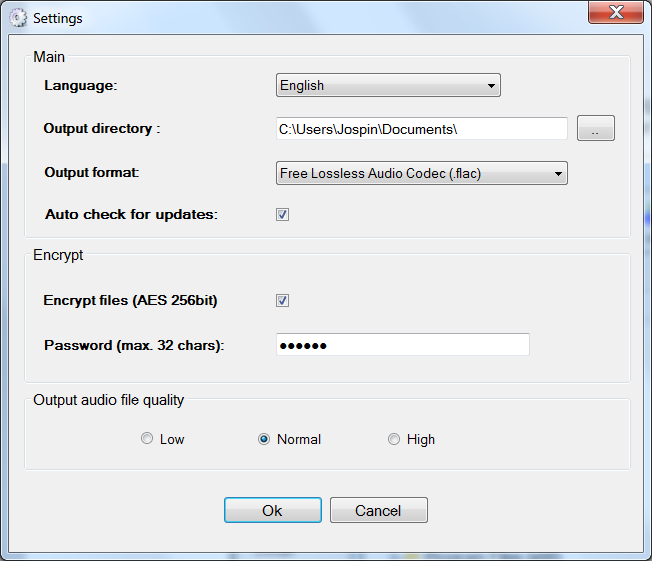 DeepSound also support encrypting secret files using AES-256(Advanced Encryption Standard) to improve data protection. 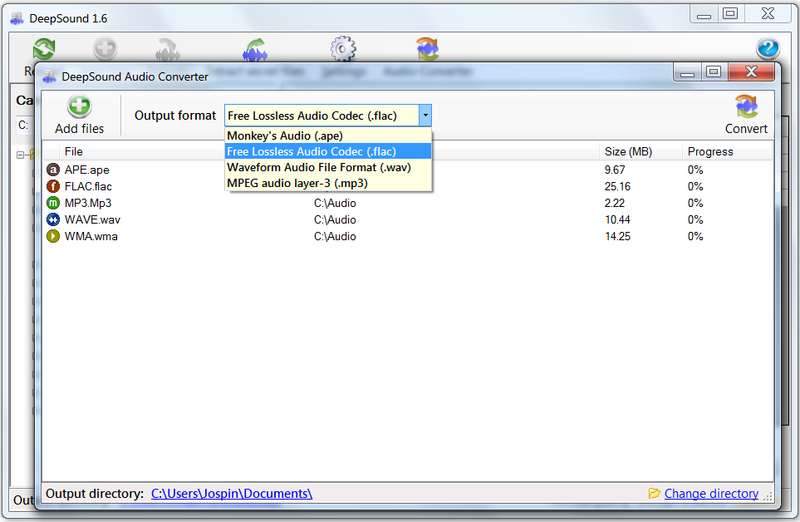 The application additionally contains an easy to use Audio Converter Module that can encode several audio formats (FLAC, MP3, WMA, WAV, APE) to others (FLAC, MP3, WAV, APE). Select carrier audio file or drag and drop audio file (flac, wav, wma, mp3, ape) into the file explorer. Click to 'Add files' or drag and drop secret files into the panel on the right side of application. Press F3 key or click to encode secret files. You can choose output audio format (wav, flac or ape). DeepSound does not support wma output format. 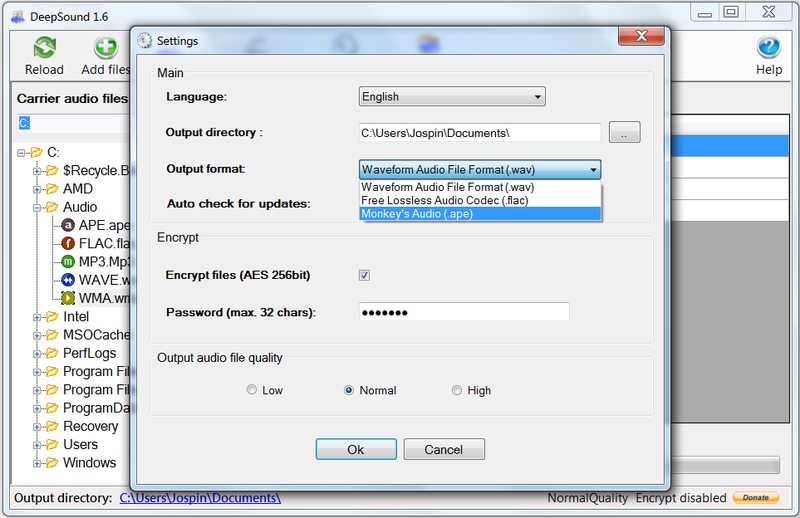 If you want to hide data into wma, hide secret data into wav file and then use external software such as Windows Media Encoder for convert wav to wma lossless file. In settings dialog you can turn On/Off encrypting and set password. Modified audio file will be copied to output directory. Click Ok to start hiding secret files into carrier audio file. In the file explorer, select audio file or audio CD track, which contains secret data. If the secret files are encrypted, enter password. DeepSound analyze selected item and display secret files. Click the right mouse button and press F4 key or click to extract secret files. DeepSound does not support creating audio CD with secret files. To create audio CD, which contains secret data, first create audio file with secret data and then use external software to burn audio file to audio CD. You can change the output audio file quality in settings. When you set low quality, the final output file will contain a lot of background noise, but you can hide most of secret data into audio file and conversely - high quality of output file = less secret data. 1,819 10,493 Jozef Bátora <img src="http://www.oldergeeks.com/downloads/gallery/thumbs/DeepSound1_th.png"border="0"> Mar 16, 2016 - 11:24 2.0 2.31MB MSI , out of 30 Votes.